The 2015 Human Rights Conference focused on UN Millennium Development Goals. 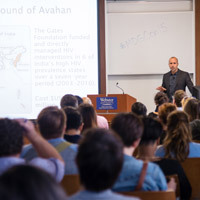 Webster University’s Institute for Human Rights & Humanitarian Studies hosted its annual Human Rights Conference at the Webster Groves campus Oct. 7-8, 2015. This year’s conference theme was the United Nations Millennium Development Goals. Next year’s conference will focus on the theme of "Equality Before the Law." This year's conference reflected on the successes and failures of these development goals, and considered the post-2015 development agenda. Guest speakers include scholars and human rights advocates from around the country; their areas of expertise ranged from heath rights and education to gender equality and sustainability. A complete conference summary is available at the College of Arts & Sciences site. Judith Blau, professor emerita of sociology at the University of North Carolina, Chapel Hill, closed out the conference on Oct. 8 with a keynote titled “The Sustainable Development Goals and Human Rights: Bringing the United States on Board.” Blau, who co-founded and directed the Human Rights Center of Chapel Hill and Carrboro, is also the founder and past president of the US chapter of Sociologists without Borders (SSF), and the author of six books on sociology, most recently “Human Rights and Sociology” (Sage, 2011).